Those of you who follow us on Facebook will be aware David and I have just returned home from another amazing two-week cruise round the Mediterranean. This holiday was celebrating David's 60th birthday last Christmas, our 10th Wedding Anniversary yesterday, plus in-between David being made redundant and taking early retirement. 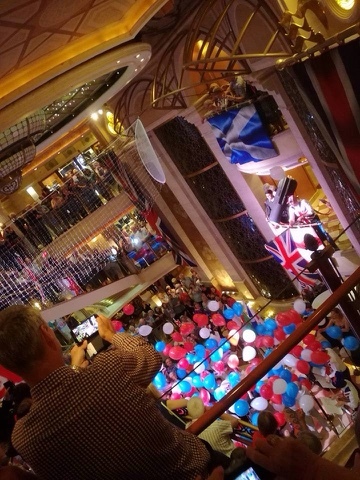 This was our 3rd sailing with Princess Cruises, but our first from Southampton, cutting out the flights to the USA. We enjoyed ports of call at Barcelona, Ajaccio (Corsica), Cittevachia (Rome), Levorno, Florence (Pisa), Santa Margarharita (Porto Fino), Marsailles (France and finally Gibraltar on our way home to Southampton. Following the sad tragedy in Manchester at the start of our holiday, we shared in Thursdays national one-minute silence and memorial service was held in a very packed theatre, with standing in all aisles. 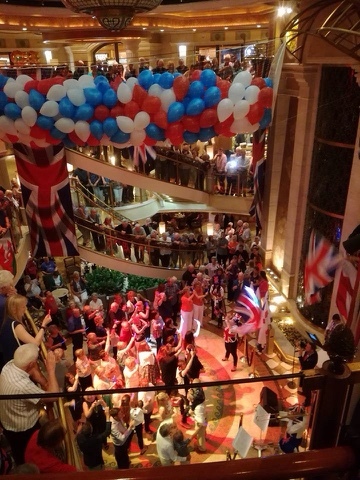 Departing Gibraltar, UK, we enjoyed a truly British patriotic afternoon party on the pool deck, with flag waving singing Land of Hope & Glory, Rule Britannia, Jerusalem etc. 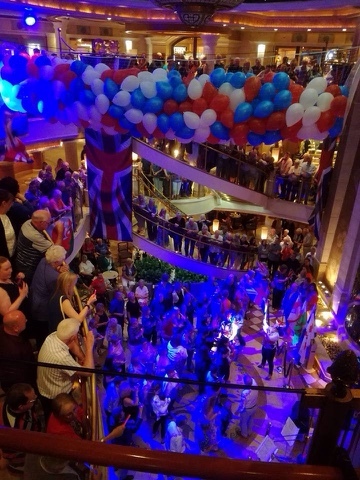 Here are photos from the continued evenings celebrations in the central atrium. We had some fabulous weather, returning to sleet and thunder and lightning on our final approach back into good old Blighty, Friday evening, but still no need for coats or warm clothing !! Needless to say I've returned with a head cold ! 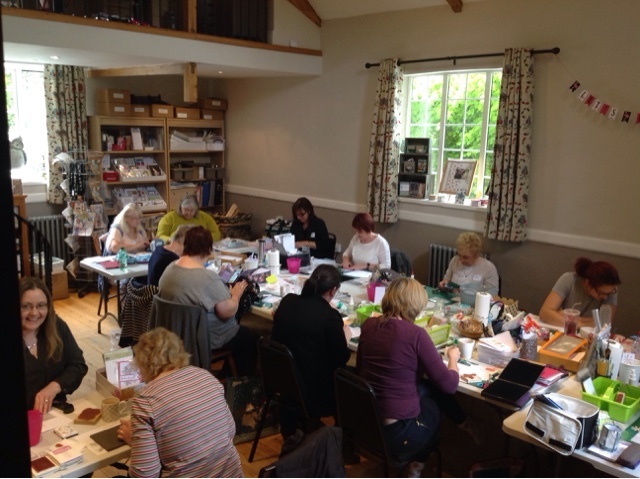 I'm looking forward to getting photos printed and will all be printed ready to create Memory Pages at a Scrapbook crop weekend in August and will post some of my favourites pages here. The album will then be on display in my Craft Studio for visitors to view. Bye for now but catch up soon. "Demo's just wanna have fun" ...... and didn't we just !! Today, I'm sharing photos from our local Team get together for a shoe-box' swap. 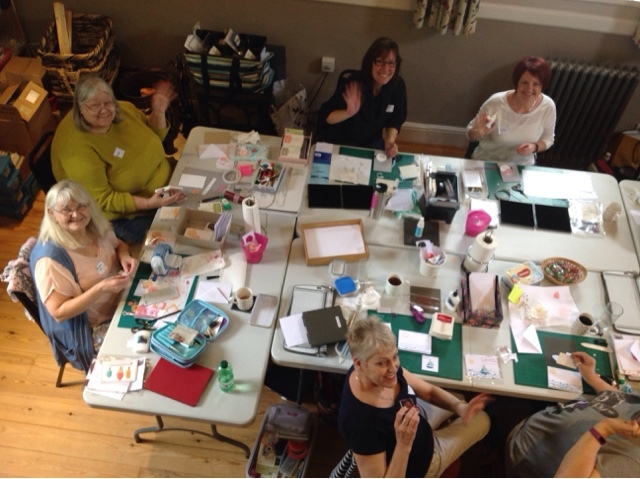 For these type of events, each member of the team participating, makes one sample card, together with a kit for each person to create the same item. Those that can't attend, or live further away, make up required number of swaps in full. 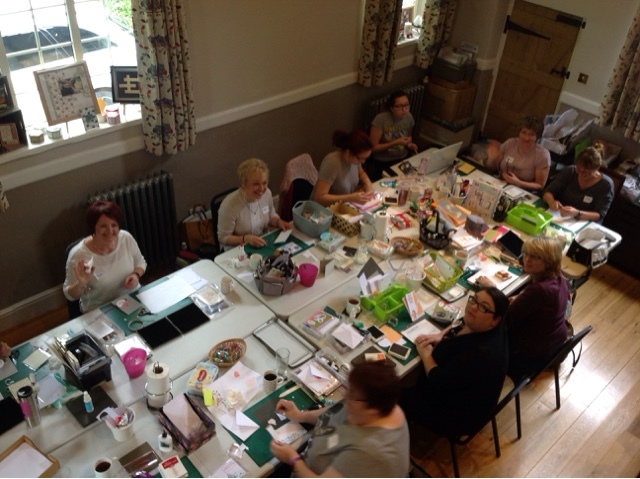 With additional tables and chairs, we also hit the record for highest number in my Stamp & Craft Studio, with Alison's daughter, there are 16 pictured here, crafting at the same time. 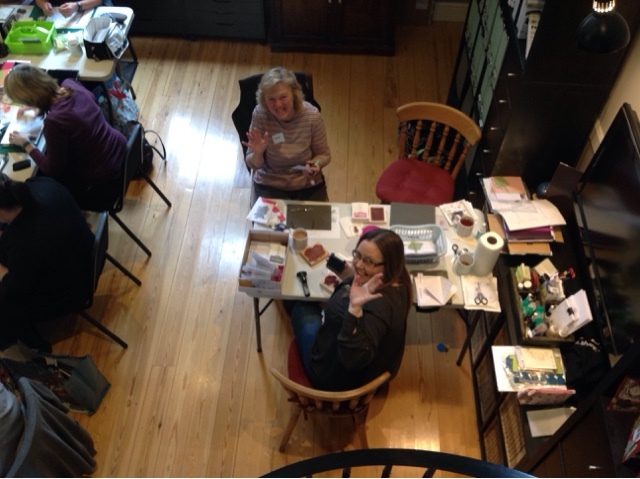 Together with postal participants and still 2 to arrive, everyone will end up with 20 swaps, all either using brand new products from ***NEW *** Annual 2017/18 catalogue or products holding over into new catalogue. If you'd like to know more about joining our fabulous team and attending FREE fun events like this and sharing ideas, then I'd love to hear from you.